You are currently browsing the tag archive for the ‘sunlight’ tag. This afternoon, I got up to take a break from working and walked by a west facing window. 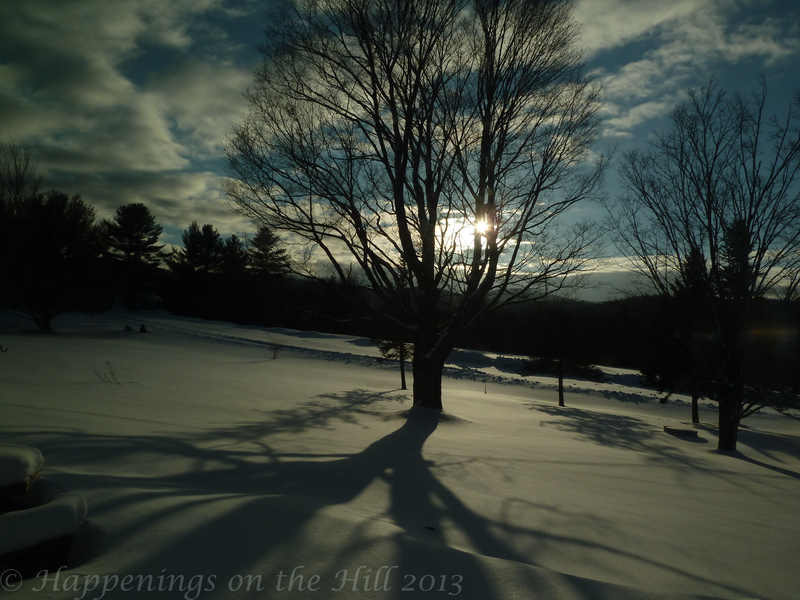 It was late afternoon, and the view of the sunlight (which we have not seen much of in these parts recently) shimmering snow, clouds and shadows just painted a beautiful picture that I felt compelled to share. I love it when nature just stops you dead in your tracks and you have to take a deep breath and appreciate how small and inconsequential you really are in this great universe. This afternoon, at this moment, was one of those times. Simply breathtaking in person, I hope that you might have been somewhere where you saw something just as nice today. If not, enjoy this picture. Last evening on my way driving the boys to scouts I noticed it. The green on the trees is a little less green. You really wouldn’t notice it in the daylight but in the light of the setting sun, you can see it – the trees are starting to take on a yellowish glow. I noticed that the cranberry bush in our yard is also losing its color, not quite changing yet, but a little less vibrant green. The mountains overall are starting to take on a touch of color, not noticeable really unless you watch closely, but it’s coming. Autumn is on its way. Another sign that it’s coming is the deer have started to make their way into the yard, which can only mean one thing, the apples are starting to taste good. All summer they haven’t made their way down into our field, but now, early mornings or late evenings, you can see them, making their way down, tentatively, tasting here and there. The evenings are getting chilly and the mornings are brisk – all the hallmarks of autumn. The pumpkins are beginning to turn. I love autumn, it’s one of my favorite times of the year.